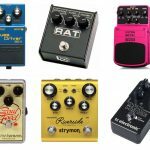 As guitar pedal junkies, finding a few of our favorite picks as the best reverb effects pedal was not a problem whatsoever. We all know that infamous effect, and although we like to speak for ourselves, many guitarists can’t live without it. There are definitely possibilities in grabbing multi-effects pedals since reverb is typically a staple-point in any pedalboard rig, but what about those who want a simple, affordable solution that’s dedicated to only the most commonly used effect in the music world today? Cue the dedicated reverb pedal, and today we have quite a few we’d like to recommend you. 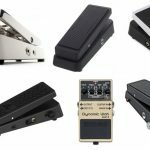 First things first, just like many other guitar pedals in the market, even “effects specific” models come in different shapes and sizes. Do you need to fit your reverb pedal on a current rig or pedalboard? What about in the studio? 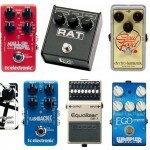 A few of these are the typical pedal size, while others come larger (with more features, of course). How many types of reverb are you looking for? Just need something simple, or a pedal with different “types” of reverb, such as spring, hall, room, shimmer, plate, etc.? If you’re unaware of what these even mean, don’t worry. We like this article on reverb types if you’re in need of some extra reading. Otherwise, just know that many of these also give you the ability to tweak and customize your own reverb effects, or at least significantly adjust the types it offers. A few even have presets of parameters created by popular artists, or better yet come with software that allow you to create your own. It’s up to you if this process is something you want, since we know others who just want a pedal with a few reverb effects. Lastly, what other extra features are you looking for in a reverb FX pedal? Aside from the reverb of course, or perhaps different “types” and parameters available, some reverb pedals even come with expression inputs, true bypass, MIDI in\out, a “reverse” reverb effect (quite popular with many we’ve learned), “trails” adjustment, and more. We’ll leave up to you what may be considered “important”. 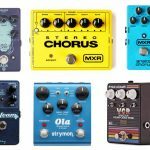 Let’s begin our list of the best reverb guitar pedals with a reliable and overall stable solution in the Hall of Fame 2. With decay, tone and level adjustments on top of the reverb algorithms TC gives us (you can pitch-shift the effect up an octave to adjust accordingly), you can get some nice ambient styles with this one if that’s what you fancy in your tones. There is also something called a ‘TonePrint slot’ (three of them in this one), which syncs your pedal with their app to download custom-designed presets by artists or even use their editor software for your own custom presets. A bit more ‘new-age’ if you will and some may not find this necessary, but for others, why not? I don’t mind being able tweak FX the way that I personally want instead of relying on browsing through presets to find one that may match what I’m looking for. Lastly, we have a mash footswitch to give us expressive effects, which is pressure-sensitive and mimics a real expression pedal (the little button on the bottom there). You can swell reverb effects in and out as you please, or perhaps give it some other parameters to adjust when you hit it. Ultimately, the reverb sounds in this one outshine the little features here and there TC has included to catch eyes, so overall this one is recommended merely for the sound alone. 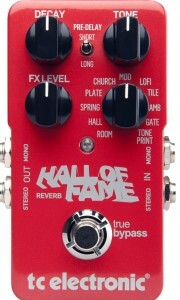 We love the TC Hall of Fame 2 as our pick to be the best reverb effects pedal in the market today. We’ll continue the list here with one of the best reverb pedals out there at the moment, albeit definitely with a price. If your budget allows, you’re getting all-things reverb jam-packed into one (relatively) little pedal. You’re getting what you pay for — twelve different types of reverb FX, effects editing yourself while being able to store 300 on-board preset slots, and SHARC DSP power for stability. All adjusted with knobs, the twelve types of reverb here may be “overkill” for some, while others prefer flexibility and assortment at their fingertips. We have some hall, room, swell, shimmer, plate, and spring to name a few, all visible at the left of the pedal with a display screen for further aid in navigation as well. The higher cost is also justified by tons of I/O options for those who find it worth it. Stereo ins and outs, an expression pedal, as well as MIDI in\out. These definitely aren’t “essential” in a pedal since many of you may be seeking a standard-sized reverb pedal to add to your existing boards, but others may find the price worth it if you’ll be using all of the extra features added in this one. At the end of the day, the actual sound of this pedal is what makes it a favorite among many, so we recommend listening to some demos or videos before you buy. 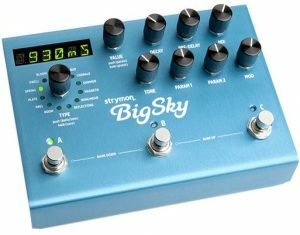 Check out the Strymon BigSky Multidimensional for a beast of a reverb pedal. Mr. Keeley brings us a reverb guitar pedal that also includes delay for those interested, and we know many guitarists who feel delay is as necessary as reverb in a pedalboard. The Caverns V2 has three great reverb tapes that also include an analog-style tape delay. You can delay up to 650ms and also add some modulation if you’re in the mood. The three reverbs we have here aren’t as many as the previous two pedals recommended, but we still get some spring, shimmer and modulated reverb at our fingertips. Also notable, the switchable true bypass aids in allowing the decay to be more natural-sounding and tail off by using their “Trails” feature. This one is easy to add to a pedalboard with its top-mounted jacks and will fit nicely with any existing setup. Coming in more affordable that many, there isn’t as much pizzazz or additive features such as custom tweaking the reverb in its rawest form, but with the sound of this thing, we don’t think there will be a need for that. You still get the decay and time adjustment. 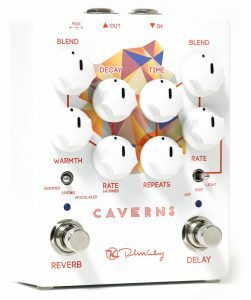 The Keeley Caverns V2 is extremely solid and another great pick as the best reverb guitar effects pedal out there right now. 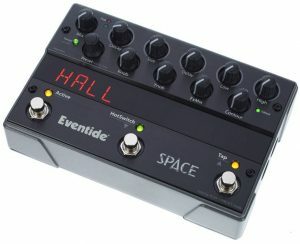 A bit higher in the budget range for some, the Eventide Space is a monster with some extra power at your disposal if you’re interested. With 12 reverb combo algorithms, MIDI control, guitar and line-level ins with mono\stereo operation, this is more than just providing ‘reverb’ in a setup for you guitarists. On top of this we have a tap-tempo and MIDI clock-sync feature for great band integration, as well as multi-effect delays, shifting pitches, and tremolo. The reverb types we have here include room, plate, spring, hall, shimmer, reverse, dual verb, mod echo verb, mangled verb, dyna verb, and tremolo verb. Also notable is the 100 factory presets but you have unlimited with MIDI if you’d like to create your own or gather some from around the net. With a very sturdy build in a rugged cast metal and nice metal foot-switches, this will last you a while as an investment — we’d hope so at half a grand. Regardless, there are a few features here that are going to really justify dropping this much on a pedal for reverb, but if you find a liking to its power, you have the perfect reverb pedal in the Eventide Space. It’s reviews back it all up. 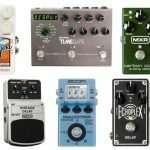 Nearing the half way point of our guide of the best reverb guitar pedals, we’re met with an Electro-Harmonix model that has quite the reputation among guitarists. 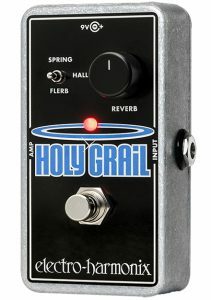 Coming in at a very affordable price and better for those with a lower budget, the Holy Grail is a nice compact pedal with three included algorithms. We’re getting spring, flerb and hall here, and although not as many choices or perhaps spice as a few others previously mentioned, gives us the essentials in regards to adding reverb FX to our tones. You can use the three algorithms as they are and unfortunately can’t tweak them or make your own, but we have a decent variety here — spring with a classic guitar amp sound to it, hall for a big rich feel, and flerb for a haunting and fresh feel. We wanted to recommend this one not only for the user reviews backing up its sound and feel but the price-friendly tag as well. It’s been praised for its bang for the buck, great build and simplicity. Grab the Electro-Harmonix Holy Grail for an easy choice as the best reverb pedal out there at the moment. We remember our dad having a plethora of Boss pedals in his rig when we were younger. The RV-6 is one of their finest reverb pedals to date, and although “vintage” looking (which we love) to some, this gives us a solid reverb feel with 8 modes altogether (mod, spring, plate, hall, room, delay, shimmer and dynamic). There’s also an expression pedal input, as well as mono or stereo operation, too. It’s known among user reviews as having a very solid build, dependability and rich sounds (especially the shimmer, mod and delay features). Boss pedals are famous for their longevity — we’re pretty sure our dad still has a few of his lying around even though he doesn’t shred as much as he’d like to. I’ve tried bugging him to give them up to me but no luck as of now. 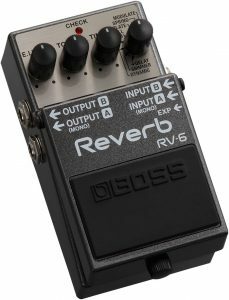 Grab the Boss RV-6 for a reliable reverb pedal at a pretty low price here. Marshall makes an appearance here with its RF-1 despite being a bit rare right now (at least what we’ve seen on the net). 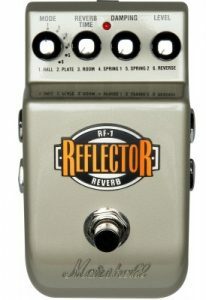 This reverb guitar effects pedal has six adjustable models (plate, spring, hall, spring 2 and room), separate time, level and damping controls, a 9V input, stereo outs and expression ins for some options in regards to live control, as well as a rugged housing to last as investment for years. Many have also praised this one for it’s “natural” sounding reverb as opposed to others with a digital-based feel. This will be a great addition to your rig if you wanted a more digital-sounding and capable pedal that isn’t beefy in size or price. Many love the reverse reverb here and literally buy it for that. Look into the Marshall RF-1 Reflector if none of the reverb pedals thus far have stood out to you. 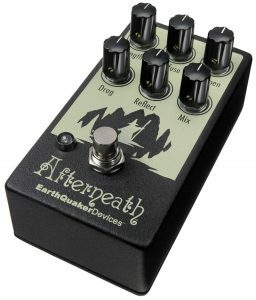 Nearing the end of our guide, the Afterneath version 2 has some unique controls of reverb effects other pedals don’t offer. Grab this pedal if you’re into tweaking tones yourself — you can mess with the length, diffuse or dampen controls, as well as adjust decay time, tonal abalance and delay spread. You can also use the “drag” control which is essentially increasing or decreasing the delay time between the individual delays. The “reflect” control also allows you to tweak the regeneration of the effect signal. This one is all about control. If you’re one to know what you want and prefer to find that feel and sound yourself, this is one of the best reverb guitar pedals out there in regards to this aspect. The sound is also beautiful and although not as many reverb variation choices, won’t matter much with all of the tweaking you can do here with the EarthQuaker Afterneath V2. Decently priced, too. The M300 had too many user reviews to back up its effectiveness and overall sound so we’ve included it here at the end of our list. A pretty standard pick for the best reverb FX pedal but you’re getting essentials here nevertheless. 6 reverb styles (plate, epic, mod, pad, room, and spring), expression pedal in, trail bypass mode if you’re into preserving those, and a mono\stereo option, too. This one isn’t battery operated if you’re OK with that, but it still comes with a 9V power supply in the box. A lot of guitarists praise the M300 for its simple and easy navigation, so this would be a great one for beginners, not to mention the expression pedal option if you’re one to combine the two for further control. 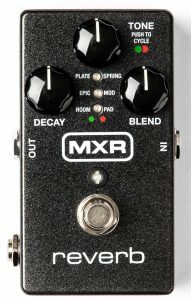 Overall the MXR M300 brings not only stellar sounds but some control on top of it all. Last but not least, the Polara by DigiTech caps off our guide strong with an obvious slick look but many options in regards to reverb choices and control. Also at a decent price, many out there praise its capabilities considering the cost. Stereo ins and outs, tail function, independent level, decay and type controls and more. Although only seven (only?) Lexicon reverb effects in this one, the controls allow you to sit with this compact pedal and tweak it for hours to create some ultra custom sounds and feels with your tones here. Rooms, halls, modulated, plate and spring reverb here to give us the essential choices we’ve all seen through out this list, the reverse as well as new ‘Halo’ reverb effect are big standouts as they aren’t as available in many other pedals in the market right now. The build is also extremely solid so in terms of longevity there will be no complaints. 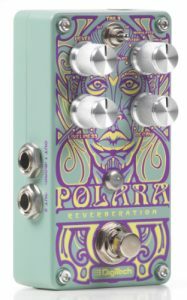 All in all the DigiTech Polara packs a powerful punch with many capabilities in a compact pedal build to finish our list of the best reverb guitar effects pedals.